Hey NYC, LA, want to see why Dayton is great! If I were living in New York City, and looking to rent for $500 a month, I’d be in less than 200 square feet of squalor. DESCRIPTION: STATELY BRICK MANOR displays old world charm & craftsmanship! Unbelievable woodwork & details throughout! Huge windows allow lots of natural light to this home. via Coldwell Banker Heritage Realtors – 1743 Philadelphia Dr – Property Profile. I’ve driven past this beautiful house more than a few times, but didn’t have time to stop and pick up the listing sheet. GF swore it’d be close to $200K, I was thinking $150K- the price you ask? $112,500. It’s just shy of 3,000 square feet and absolutely beautiful. It’s just a few blocks from Good Samaritan Hospital, in a the beautiful College Hill neighborhood. The price, means with a down-payment and a 30-year loan- about the price of that closet in NYC: $500 a month. Dayton is a land of opportunity, where all things are possible, including living like royalty at a pauper’s price. I love my house, I love South Park and being centrally located, but- how can anyone not see the beauty of living in Dayton as compared to elsewhere? In Oakwood, this home would be $300K plus. Maybe after tonight, I can help all of us, sell this house to someone who sees the beauty of living here instead of NYC or LA- because they can only dream of it- we can live it. Previous Post: Definition of failure in Dayton on election day. Google it and check the street view. It was the window above what is now the Slovak-Czech Varieties store. When I was there it was a construction company’s office. I had a living room that doubled as a bedroom, a really small galley kitchen that led into a shower bath. It was SMALL. Also, note that the neighborhood is nice looking now. I was there in 2004 and revisited all of my old hoods. (this is only one place I lived while there) The neighborhood has been under heavy gentrification for years. When I lived there it was very nasty. You had to watch your back. to make matters worse, homeless people used to sleep in the unlocked mail room/entrance that led to the locked interior hallway. I’ve had many occasion to step over them to get into my old pad before. Ya, I’m living large in my 1560 sq. foot American four square, even though I can almost spit onto Xenia ave from my front porch. (Really, Xenia Ave is not that bad.) Nope, most in Dayton don’t realize how good it really is here. Instead they want to talk about how “bad” it is…lol…puhleeeze. Hi David! As someone who moved from Dayton to Manhattan a few years ago, let me just say how much I wish I could find even a tiny studio here for $500. $500 can get you a studio way out in the boroughs, maybe, but here in Manhattan, even small studio apartments are twice that price. I’m paying $1,500 per month for a 1-bedroom in central Harlem. It’s crazy! On the other hand, let me talk to you sometime about the theater I’ve seen since being here, not to mention programs with world-renowned speakers and scholars, and phenomenal opportunities for vibrant Jewish life. I do miss the calmer Dayton lifestyle though. I miss it often. I miss grocery stores with aisles wider than four inches. I miss not smelling urine on my morning commute. There are trade-offs everywhere you go, I suppose. Right on, we love our “pauper’s mansion” here in Grafton Hill. We’d never be able to afford this much house anywhere else in the country. I have friends who own just such homes on Grafton. They are prisioners to the neighborhood. Guns going off night and day, crack heads coming up in your yard, can’t let the kids ride bikes. 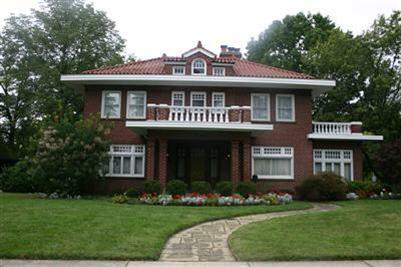 Give me a tiny bungalow in a safer part of Dayton and I feel rich. Peace of mine is priceless no matter where you live. Yes we are cramped here but I know I can walk around my neighborhood, sit on my porch or take my dog out as late as I need to. That’s the life. Watch Monday’s The Daily Show bit regarding Mayor Bloomberg’s World Series television campaign ad. Stewart exposes (as only he can) the realities of living in NYC… or San Francisco for that matter – perfectly. Congratulations on your campaign. I respect you for trying, and giving voters a choice. If nothing else, you are changing the conversation about your city.